Crafts Get The Competitive Treatment In NBC's 'Making It' If you enjoy glitter and glue and a good time, Making It might be just the summer diversion for the builder and baker and diorama maker in you. 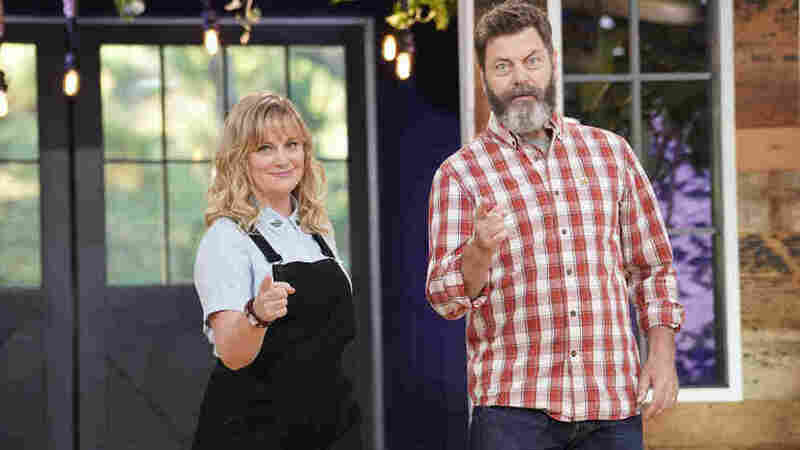 Amy Poehler and Nick Offerman host NBC's new craft competition, Making It. The new NBC series Making It has two reasons for being. One is to grab a little of the upbeat, you-can-do-it energy generated by competitive cooking shows – The Great British Baking Show especially – and expand it to other areas of crafting. The other is to give viewers some solid hangout time with the stupendously amiable hosting pair that is Amy Poehler and Nick Offerman. All put together with some staples and glue, it's a lovely, if very low-key, summer watch. The series is a brisk six episodes, premiering July 31st, and it begins with eight crafters who do everything from sewing to woodworking to paper crafts and more. The real-life Offerman is an accomplished woodworker, so he takes the role of the knowledgeable host, while Poehler is the bright-eyed newbie with lots to learn. Each episode has a theme and follows the contestants through a shorter challenge and then a longer one. They make a variety of projects from a variety of materials, and at the end, they're judged. The judges are Simon Doonan, a sort of all-around Fashion Person who's designed store windows at Barney's, and Dayna Isom Johnson, who's a "trend expert" at Etsy. And yes, every week, someone has to go home. The format – two hosts, two judges, even the layout of the main craft room in an alleged outbuilding – recalls The Great British Baking Show. But Making It lacks that show's technical focus and close scrutiny of actual skills. When you see 10 efforts at making precisely the same cake, for instance, and they're judged on fine details like the size of the crumb or the thickness of the frosting, you really do feel like you're learning something about some fairly technical aspects of baking, and the authority of the judges is never in question. But when ten people build Halloween costumes from household junk, the critiques are far more vague and subjective, not getting much more concrete than originality and neatness. If you've ever seen a judging panel on Project Runway, Doonan and Johnson both feel a little more like guest judges, perhaps actors or athletes who can say intelligently what they like and don't like, than they do like the professional designers who can analyze precisely what went right or wrong. That's not to say it's not a lot of fun to watch people invent projects to meet briefs like a stadium-shaped snack server or, yes, a Halloween costume made of household junk. The crafters are creative and unendingly good-natured, even if it would be nice to know a little more about the details of the techniques they're using. Whatever the show lacks in technical precision may not matter much to people who just want a piece of summer TV that offers good company and a gentle, family-friendly tone headed up by super-charming hosts. For fans of the departed comedy Parks and Recreation on which Poehler and Offerman co-starred, it's a thrill to see them goofing around and cracking each other up again. But for other viewers, this might be a chance to discover them as themselves, and the structure of Making It leaves a ton of space for them to do their thing. They make puns, they hurl silly jokes back and forth, and they will, as intended, take your mind off your troubles. While that might seem like a modest aspiration, when it's done very well, it recalls the best variety shows and other host-driven entertainment. Making It is part of the newer trend of competitions that are never mean, always upbeat, and dominated by people who support each other in the spirit of friendly competition. Plus, you get to hear Nick Offerman's extremely surprising giggle in just about every episode. Taken on those terms, it's a treat.